University of Texas System Chancellor Bill McRaven will remain in his job beyond the expiration of his contract at the end of the month. But some of the tensions that made his future seem uncertain remain. *Editor's note: This story has been updated to add that the Texas Tech University System chancellor is also under contract. 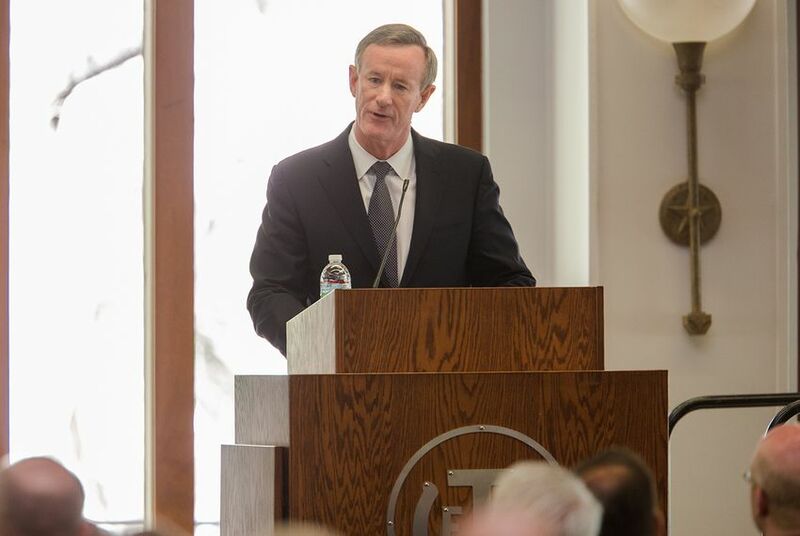 This summer, after a bruising state legislative session for the University of Texas System and amid a debate over staffing and expenses of UT System offices, two questions loomed over Chancellor Bill McRaven: Will he still be chancellor in 2018? Or will UT regents choose to let his contract expire at the turn of the year? The answer to both questions appears to be "yes." McRaven is on pace to continue on as chancellor in the new year, but regents have no intention of renewing his annual contract, which promised $1.2 million in base pay. Instead, like most other UT System employees, including university presidents, he'll work with no written employment contract. System leaders insist that people shouldn't read too much into that decision; it's not a sign that they plan to part ways with him any time soon. When he was hired three years ago, McRaven became the first UT System chancellor to have a contract. System spokeswoman Karen Adler said regents offered it "to secure his appointment following his retirement from the U.S. Navy." "Since then, McRaven has not asked the Board of Regents to extend his contract, nor does he require a contract to remain chancellor," Adler said in an e-mail. But that does go against the current trend in Texas higher education. The University of North Texas System signed its new chancellor Lesa Roe to a three-year contract in September. That same month, Texas A&M University System regents extended the contract of Chancellor John Sharp to 2023. Chancellor Renu Khator at the University of Houston System and Chancellor Robert Duncan at the Texas Tech University System are also currently under contract. But some of the pressure McRaven faced throughout the year remains. Some regents have been persistent in pushing for big changes in how the system is run, arguing that the UT System administration offices have grown too large and expensive. The question was how McRaven, who has called for the system to think big and be ambitious, would respond. In June, he was noncommittal. When asked whether he wanted to stay on as chancellor, he said “I want to see the direction that the board is going.” He struck a similar tone a couple of months later. This past year, he has scrapped plans for a system campus in Houston after pushback over the system’s $215 million purchase of land for the project. And regents approved a change in policy that sent a slightly larger share of the system’s revenue from a massive oil-funded endowment directly to UT-Austin, instead of allowing it to be spent at the system offices overseen by McRaven. Still, McRaven has won buy-in on some major projects. Last week, the board voted 4 to 3 to pursue a bid to manage the Los Alamos National Laboratory, which oversees the nation’s nuclear weapons. The bid alone is projected to cost $4.5 million. Also last week, the UT regents formed a task force to review more closely what the UT System offices’ mission should be. The task force will be chaired by Regent Kevin Eltife, a former state senator who has been one of the loudest voices questioning the growth of the system. A memo detailing the plans for the committee noted that the board had expressed concern over recent budget and staffing growth within system administration. That's despite cutbacks McRaven has already made. By February 2018, system office staffing will be down to 699 — down 224 full-time positions from 2015. The system has also convened a task force to come up with plans for how to divest itself of its recently purchased Houston land. That group is expected to report back by July. “It is important that we continue the dynamic process of aligning and realigning the UT System Administration with institutional plans, while also determining what type of initiatives might lend themselves to by System-led, for the sake of efficiency and effectiveness,” Tucker and McRaven wrote. Disclosure: The University of Texas System, the University of North Texas, Texas A&M University System, the University of Houston and Texas Tech University have been financial supporters of The Texas Tribune. A complete list of Tribune donors and sponsors is available here.